David Sherman/NBAE via Getty Images Kristi Toliver and the Sparks host the Lynx in a must-win Sunday (ABC, 3:30 p.m. ET). In the immediate aftermath of falling surprisingly flat to open the Western Conference finals Thursday, the Los Angeles Sparks had different ideas about what had gone wrong in a 94-77 loss to Minnesota. Candace Parker was irritated by her team's indecisive pick-and-roll defense and lack of overall fight. DeLisha Milton-Jones saw a deficient sense of urgency. Alana Beard thought the Sparks didn't defend or rebound well enough to get their all-important transition game going. Kristi Toliver felt the Sparks started the game back on their heels, and never recovered. It was bad, period. However, it's because the Sparks are such a good team that they can be that blunt about it. Jordan Johnson/NBAE/Getty Images Seimone Augustus and the Lynx outrebounded Nneka Ogwumike's Sparks 37-25 in Game 1. The Sparks now have a do-or-die game Sunday at the Staples Center (ABC, 3:30 p.m. ET). Parker indicated maybe it was just as well that the Sparks feel the heat. "I would take our team down 10 or 15 than up 20 any day," Parker said, "because I think we play with a lot more aggression, a lot more heart and effort, when we're down." That's the kind of spin a player needs to make the best of the predicament the Sparks are in. Parker undoubtedly would have preferred that Los Angeles never gets into the situation of being forced to rally in a game or a series. But since that's where the Sparks are, she will remind them that they actually did play their best basketball Thursday when they were in comeback mode. There wasn't any panic in L.A.'s locker room at an otherwise joyful Target Center after Game 1. The Sparks seemed annoyed at themselves more than anything else. Which they should have been. The Sparks had to travel for the series opener, but they were the more rested team considering that in the time since they had finished their first-round sweep of San Antonio, the Lynx had played twice. During the first round, it seemed Seattle had revealed a potential crack in Minnesota's title defense and that the Sparks just needed to come in and pound away at that vulnerability. It just didn't turn out that way. After a close first quarter, Minnesota all but sealed the victory by scoring twice as many points as Los Angeles in the second quarter. The Sparks went on some runs in the second half, but every time they'd be on the verge of making the Lynx uncomfortable, Minnesota would get a basket or defensive stop. "When you don't rebound, No. 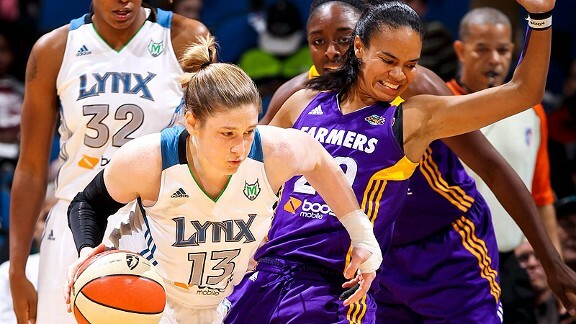 1, you don't deserve to win," Ross said of the Lynx's 37-25 edge on the boards. "And, No. 2, everything else you try to do is more difficult. They had 24 more shot attempts than us, and quite a few came off offensive rebounding." The Sparks, like the Lynx, were very good at home this summer, going 16-1 in the regular season in L.A. Their only loss there was June 24 against San Antonio. Los Angeles is trying to make the league finals for the first time since 2003, which is a long time ago in terms of personnel in the league. But the Sparks do have one player, Milton-Jones, who was with them, in 2001-02, when they won back-to-back WNBA titles. "It looked very chaotic," Milton-Jones said of the Sparks at their worst Thursday. Then, like Ross, her former college coach at Florida, she stressed how imperative it is for the Sparks to hit the boards Sunday in order to extend their season. "We really have to put a lot of our focus on our effort and what we do once the ball is shot and hits the rim," she said. "From that moment on, we have to know the ball is the most important thing."